The OARDC Research Enhancement Competitive Grants Program is funded by appropriations made to the Ohio Agricultural Research and Development Center (OARDC) of The Ohio State University. The goal of the SEEDS is to foster research excellence among OARDC-supported scientists and faculty in the College of Food, Agricultural, and Environmental Sciences. Provide undergraduate students with research experiences. 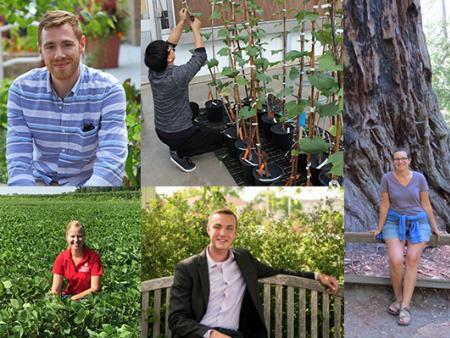 The winners of the OARDC SEEDS Grant for the Department of Horticulture and Crop Science are Katie D'Amico, Stephanie Karoff, Nathan Nordstedt, Alex Turo, and Hongrui Wang. The focus of my research is on aging and its impacts in perennial plants, particularly fruit and nut crops that we rely on for food. To study this topic, I work primarily on almond, a high value nut crop that experiences an aging-related disorder known as non-infectious bud failure (BF). This disorder affects kernel yield resulting in economic loss for growers and disruptions in almond supply for consumers. To address this issue, we are working to find better predictors of BF potential in almond trees by studying aging and its impacts in this species. Our goal is to identify suitable predictors of BF that can be used by almond growers and producers to limit BF exhibition in orchards. This work will also advance our understanding of aging in perennials, a neglected research area that has the potential to affect many economically important crops. Stephanie's research will focus on characterizing a new source of partial resistance to Phytophthora root and stem rot in soybean. Specifically, she will be studying a major resistance locus' effect on pathogen entry and development. Phytophthora root and stem rot is the second most yield-limiting soybean disease in Ohio and this work will facilitate future cultivar development and our overall understanding of partial resistance mechanisms. My dissertation research focuses on the identification and characterization of beneficial bacteria with the ability to alleviate drought stress and increase the quality of floriculture crops. I am taking an approach of isolating novel strains of bacteria and screening the entire collection through in-lab experiments to determine strains of interest. I will then test the strains of interest in greenhouse trials with cultural practices common to most production systems. With funding from the OARDC SEEDS grant program, I will be sequencing the genomes of the bacteria-of-interest, allowing our lab to identify bacteria genes involved in alleviating drought stress and promoting growth in plants. My project will directly impact the formulation of biological products specific to floriculture crop production systems, and therefore help growers to increase the quality of crops during production, harvest, and transportation. I research the molecular biology of bacterial plant diseases, which in my case means that I study the molecular weapons used by bacterial pathogens to turn a plant’s immune system and physiology against itself. Bacteria do this because they need to overcome certain environmental challenges once they make it inside their hosts in order to cause disease. Chief among these challenges are the host's immune system and a scarcity of water. I study a pathogen (Pseudomonas syringae pathovar tomato) that overcomes both of these obstacles by injecting protein weapons called "effectors" into host plant cells. Inside host cells, effectors suppress immunity and cause water to flood from inside the cell into the intercellular space where the bacteria are waiting. This triggers “water-soaking” syndrome, where infected plant tissues appear water-logged to the naked eye. Astonishingly, although water-soaking is a ubiquitous feature of most bacterial and fungal plant diseases, no mechanistic explanation for this syndrome exists. Therefore, my OARDC-supported project is the construction of a fully mapped-out mechanistic explanation for how P. syringae causes water-soaking. If successful, this project would constitute a significant advance in plant pathology and present new possibilities for breeding disease resistance into vulnerable crops in Ohio and beyond. Abstract of Hongrui's research: The grape and wine industry contributes $1.3 billion to Ohio’s economy each year. However, the sustainability of this industry is limited by climatic constraints, primarily seasonal freezing temperatures. The 2014 polar vortex caused $12 million losses to Ohio vineyards. Recently, the Dami Laboratory succeeded to increase freezing tolerance (FT) of cold sensitive grape cultivars using exogenous abscisic acid (exo-ABA) via foliar application. However, the underlying mechanism by which ABA impacts FT remains unknown. It is the purpose of this study to investigate the role of exo-ABA on the expression of key genes in the ABA metabolic pathway. Specifically, we propose 1) to evaluate the influence of exo-ABA on the expression of genes regulating endogenous ABA (endo-ABA) synthesis and catabolism, and 2) to evaluate the influence of exo-ABA on dormancy, FT and other physiological parameters in grapevine buds. It is expected that exo-ABA will induce the expression of genes associated with ABA biosynthesis and will subsequently increase endo-ABA content, which will lead to a series of physiological responses that ultimately will enhance FT of buds. The results from this study will advance our understanding of the role of ABA on FT, which will be useful to develop future strategies for crop improvement and protection from cold damage.